The people of Rigside and Douglas Water have won a partial victory after kicking up a stink about a food waste pit near their villages. Since last year, villagers have been complaining about the stench coming from a “digestate storage lagoon” at Stoneyknowe Farm, between their villages and Sandilands. Some local residents claim that the “sickening reek” during the filling and emptying of the lagoon means they cannot even put their washing out to dry and that it has made even a walk to the local convenience store an ordeal. Initially villagers making complaints about the lagoon were told by both the council and the Scottish Environmental Protection Agency (SEPA) that there was nothing they could do about the situation, saying that the lagoon was in line with planning and enviromnental regulations, so long as the degraded waste there was for the use for fertilising the farm alone. However, residents quickly gathered evidence to show that the slurried waste was being taken to other farms in the area and that the lagoon was the centre of a commercial operation, requiring planning permission. Eventually, late last year, South Lanarkshire Council relented and ordered that a retrospective planning permission application be made for the lagoon. The Gazette now understands that the application was withdrawn just days before a council planning committee meeting this week, which would have probably rejected it on the recommendation of its officials. 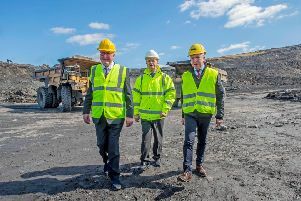 Local councillor George Greenshields told the Gazette that he would rather the application had not been withdrawn as he understood that this would leave the operators free to continue to take the slurry from the lagoon; they would not, however, be allowed to add any new waste to it.